Got another link for this page? Contact us with your information. 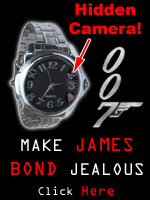 Secret Agent Magazine Gift Shop: T-shirts, mugs, hats, cameras, etc. Spy Gear & Merchandise L.L.C.